Keeping an eye on the weather today, we managed to put together a full day of activities at Quincy and Camp Harbor View. I started the day at Quincy catching tons of minnows and hanging out with the kids on the dock teaching them how to fish and be patient for the schools of minnows to come back after my devastatingly keen hand eye coordination mixed with deadly accuracy and speed to match a moderately fast gazelle. I zipped over to North Quincy station to pick up Shenee for some Camp Harbor View Fishing club. We had one kid catch a fish that jumped off the line as he was pulling it up to the dock and few instances of some really nice sea weed gracing us with its presence by being pulled up on some hooks. We did however find tons of crabs down on the shoreline while the tide was low and had some kids hold a crab for the first time ever. All in all a good friday to close out the FOURTH week of the summer programs! Today we managed to catch some good weather in the morning, and went to George's Island. After hearing the story of the "Lady in Black," everyone was anxious to get in the dark tunnel. Right after lunch we walked down to the fort and right into the tunnel. A few of us were a bit timid at first, but in the end we almost all went through the tunnel and back. A few brave souls even claimed to see the Lady herself. After that all of the tunnel adventurers decided to come up with Bruce and me on top of the fort. We explored all of the watchtowers and marveled at the only cannon left up on top of the fort. Unfortunately, while we were up on the roof, the rain began to fall and we were forced to hide out in one of the watchtowers for a couple minutes. However, while in the tower, we all had a great view of the city and the other harbor islands. On the way back from the island the poor weather continued but it was not at all bad. As a result of the bad weather, the boat began to rock and everyone on the top deck, along with myself, had a lot of fun rocking back and forth on the harbor before we got back to the Bank of America Pavillion. Hey my name is Darius. This is my second year with Save the Harbor/Save the Bay. So far I've been working at Dorchester, Piers Park, Camp Harbor View. It's been great working at all these places helping the kids fish, catch crabs and find out how they tangle the lines up. The kids in Camp Harbor View managed to catch a striped bass over in Dorchester. They go sailing a lot. The Piers Park kids are all way active. 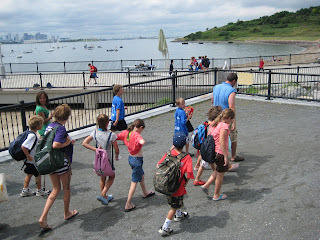 At All Access kids go to Georges Island and Spectacle Island. Everything has been going swimmingly so far and this has been a thoroughly enjoyable summer season. Hey everyone! It's Thi from Save the Harbor/ Save the Bay. This morning started out great, the sun was shining, the kids coloring the Northern Quahog, kelp, and green crabs. We all went inside the Bank Of America Pavilion and David told everyone what to expect and he also told the story of the woman in black. The kids hung onto his every word... then it started to rain. It was going to be light rain (it was already pretty hard) for the next half hour, then it was going to pour. Everyone stayed inside the pavilion and the Seekers decided to put on a performance for us and it was fantastic! After all the dances, we played Shipwreck. At the end, it was a girl from the Seekers who won. It was really funny watching all the kids do the exercises, like "Time for grub", "Shipwreck! ", "Stern! ", "Man overboard! "and many more. It was really fun and I can't wait to do it again! I'll update this post with pictures later. 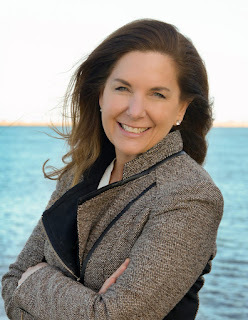 So I have recently swapped sites with Jay (another Save the Harbor Save the Bay Senior Marine Educator) and I want to fill you in on the transition. Apart from being directionally challenged and never being able to find my way anywhere, I've actually been doing alright so far... knock on wood. At Quincy we've been catching minnows, crabs, hermit crabs and shrimp as well as venturing out to the marshy areas to get mussels for crab bait. We just started our activities at Camp Harbor View today, which was slightly hectic and yet fun because the kids were so happy to be fishing. It was many of the campers first times fishing so the interest was high and learning amplifier was cranked to 11. Just thought I'd post a couple pictures to let you see how we're doing. Today was another day at George's Island, but each visit brings new and exciting events. We got to spend today with two big groups: Piers Park from East Boston and Red Oak After School Program from Chinatown. After boarding Red Oak, we voyaged over to East Boston to pick up our Piers Park group. Then we were on our way, leaving the sweltering, humid city behind. The breeze swept the water and created the perfect summer temperature on the boat. We got to the island and groups parted ways. After lunch, you could see some kids running through the dark tunnels of the fort, some playing field games, and others climbing rocks along the shore. On the back side of the island, we found old lobster traps crushed between the rocks most likely from hurricanes, old washed up buoys, and other obscure objects. Time flew by, and not before long, it was time to board the boat back to reality. The harbor islands feel like a whole different planet when you are there, but they are only a short boat ride away from the city. I wish everyone has the chance to experience and enjoy the Harbor Islands!! The official name for the Green Crab is Carcinus maenas. It is referred to by different names all over the world. 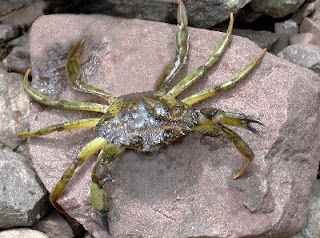 Indigenous to the British Isles, the Green Crab has successfully been prolific throughout the North American West and East coastlines, part of the Southeastern South American Coastline, and parts of both the southern African and Australian coastline as well. Along with these areas the crab has invaded, it is predicted to soon invade and dominate on many other shorelines across the globe. The Carcinus maenas has been known not only to be green, but brown, gray and red also, with the red crabs being known as the most aggressive. The species' invasiveness has become a problem in many areas, and great efforts are being put into action to cease the Carcinus maenas problem. One example of this, according to Wikipedia: In 1995, Edgartown, Mass put a bounty on the Carcinus maenas, resulting in 10 tons of collected crab. If you want to learn more about the Carcinus maenas I recommend you check out your local library. 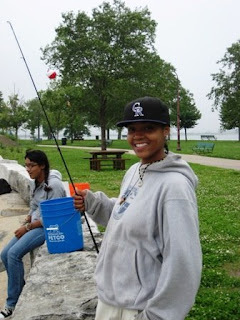 Hi, my name is Basima and I work as a Junior Marine Educator with Save the Harbor Save the Bay. It's true you learn something new everyday. So far I've been having the time of my life in all the sites at: Quincy, Dorchester, South Boston, East Boston, Piers Park and Camp Harbor View . The campers at Piers Park - which is my current location - are filled with enthusiasm and are always ready to have a good time . We've been enjoying our summer by playing games, going fishing and participating in hands on activities with the marine life we've worked so hard to catch. I'm new to the All Access trips but really looking forward to it! I've heard nothing but good news and today I'll get to enjoy a beautiful summer day doing what I love to do; working with kids who like to learn about marine life and have fun on the waterfront. Since I am always talking about our stellar catches- I thought it would be helpful to back up my claims with pictures. Here are pictures of sea stars and a lobster. 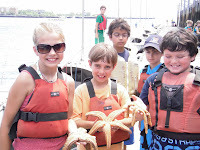 I also included a short sea star film that one of our Courageous sailors took! A Montage, a Crabbing Montage!! 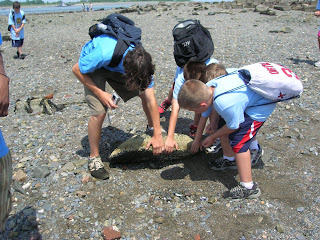 The kids at Camp Harbor View LOVE catching crabs using pyramid crab traps and by turning over rocks on the shore. We usually catch Red Rock Crabs off the pier with the crab traps and catch dozens of Asian Shore Crabs along the shore. Well everybody, I am reporting to you after a fun and exciting day at our Quincy site in Black's Creek. We started off the day getting to know our campers through a series of fun games such as fish, shark, and algae. For fish, shark and algae, in the spirit of the more famous rocks/paper/scissors shoot game, each of the three choices wins against one but loses to another. The breakdown is that the fish eats the algae, shark eats the fish, and the algae cleverly deters the motions of the shark. The campers are divided into two teams and call out what creature they have selected. If you have indeed beat the other sides' creature with your own, you rush over to tag them before they reach base. If you tag them, they join up with your crew. We went back and forth for ages, just having fun and trying to develop strategies. When it appeared that no side could gain the upper hand, one team yelled "fishermen!" with a chorus of laughter. Thus, the game ended on a good note because the kids were clever enough to know that fishermen trumps everything else. Today we had a visitor at Courageous! Tommy (a fellow Marine Educator) came to explore with us on the Green Boat, and to see the wonders of our lobster traps. While on the boat we were able to view the cormorants and terns that have nested in East Boston, as well as observe the various types of gulls that follow the lobster boats. We also got some fishing done from the stern of the boat. While on the dock, Tommy pulled up five hefty sea stars from one of the traps (which contained the remains of the carp found at Courageous last week). What I left out of my previous post is that carp are freshwater creatures. This fish most likely came in from the Charles River with all sorts of other gross things as a result of all the heavy rains that this summer has brought. At least we saw the sun today! I hope everyone enjoyed their Monday as much as I did. Hello again! This is Janet coming to you live from the Save the Harbor main offices on the Boston Fish Pier. This morning we had our weekly program staff meetings, where we gather all 17 of our summer program staff members and some Dunkin Donuts "Munchkins" in one spot to talk about last week's explorations and next week's adventures. As we went around the table we found ourselves discussing once again the skate that was caught a few weeks back at Camp Harbor View. Skates are of particular interest to me because they belong to my favorite class of fish (and also a great hangman word), Chondrichthyes! As you might know scientists divide all known living things into groups based on certain characteristics (this is called classification). You could try the same thing with a group of friends by choosing a characteristic - for example the type of shoes people are wearing - and then divide them into groups based on that characteristic, such as those with flip flops, those with sneakers, and those with everything else! The basic idea behind classification is that creatures who belong to the same group share common characteristics and are related to each other. So fish in the class Chondrichthyes are similar because they all are jawed fish with cartilage skeletons (plus some other specifics related to their physiology but we won't get into that here). Cartilage is the same material found in human ears and noses - a very flexible but strong connective tissue. In fish from the class Chonrichthyes, such as skates, rays, and sharks, cartilage makes up the entire skeleton - so there are no bones!! Because these creatures live in the water they can still grow to pretty huge lengths (whale sharks - which are the largest fish in the ocean, grow up to 45 feet long) even though they don't have bones. If they were on land, the creatures would need to be much much smaller, as they would not be able to support very much body weight with just a cartilage skeleton! About 2 weeks ago at Camp Harbor View a group of campers, Jason, Conor, Basima and myself caught a skate! It was big and looked very much like a stingray, but it wasn't. There are differences between skates and stingrays that not too many people notice. The first difference is the skate's tail - it never has a large spine or a "stinger." Another difference is the fact that skates don't have venomous barbs like those of a stingray, and lastly, skates tend to live in marine habitats. This summer has gotten off to a great start at Courageous. We have two lobster traps set off the dock, which we pull up everyday at lunch. They have NEVER been empty. This week we found a giant carp, and used it as bait in one of the traps. 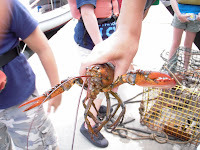 The next day when they were pulled up we discovered such a variety of creatures- the most popular were the two lobsters (Homarus americanus), a sea star (Asterias vulgaris), and approximately 20 crabs (of three different species). I noticed a lobster boat putting traps right next to ours- It will be interesting to see if those other traps will change our daily catch this week. Rock, Paper, Scissors at Spectacle? Today was a great day out on the harbor. We began at the Bank of America Pavilion with all groups present. Always a good start. One of the things I like to challenge our participants with is to do something today they have never done before. Don't make it my responsibility, I'm happy to help, but do something for the first time. It's a good daily challenge too. Several people had never been on a boat. That's my favorite "first time". Others had never been to Spectacle Island. Today, on the boat ride back to S. Boston, as people tried to tell me their "first time", many said they had never played Rock, Paper, Scissors, the way I played. And if you want to know how I play you have to come with us to Spectacle or George's Island. Today involved at least 25 people but there is no limit. So bring it on! See you on the harbor. Today we took our second trip of the season to Spectacle Island. Let me tell you, it was a blast! Although the weather turned on us, we still managed to have fun and make the best of it. 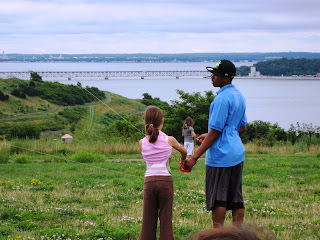 The wind was actually perfect for flying kites up on the top of the 176 foot hill. Not only is this wide open area great for flying kites, playing games, and eating lunch, it also offers spectacular (no pun intended) panoramic views of Boston and the harbor. 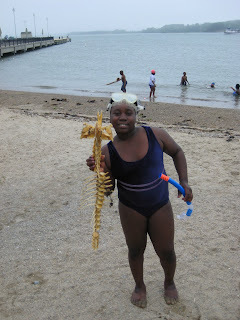 As we were touring around the island, we found a full three and a half foot skeleton of a marine creature on the beach. We are not quite sure what type of carcass this is, but it is being analyzed as we speak (most likely remnants of the Loch Ness monster). 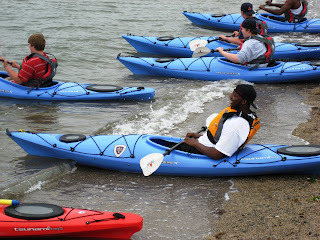 Spectacle offers guided kayak tours along the shores of the island, so one of our groups decided to venture out and explore. 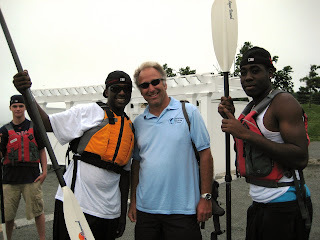 One member in this group (Gregory) had never been on a boat before today, not to mention a KAYAK. It was fun to watch his excitement and nervousness as he experienced something new. On the beach was another group splashing around, snorkeling, and enjoying the 62 degree water and a 64 degree day. We couldn’t let them have all the fun in the water, so me and my good pal Alex decided to join them: unbearable, but worth it. Maybe next time the water will warm up a bit, so make sure to bring your suit!! The campers pile onto the green at Piers Park. I round them up and attempt to keep them all in the same general vicinity. The excitement is brewing and anticipation building up in not only the kids awaiting a beautiful day at Spectacle Island, but myself as well seeing as I have never been to a Harbor Island before. As the boat arrives all doubt of cancellation is lost and our trip of learning and exploring begins. We all get on the boat and the snack buying commences with “Cheetos” and “Hershey’s” (notice quotations as to not pull a Jason and infringe upon someone’s copy rights). I was not sure how to respond to being called dad by one of the campers and I decided not to delve into it's deep meanings, but to remain indifferent about the situation by continuing as though Alice was not still laughing at me. Once we laid foot upon the island we had lunch with some familiar faces. Jay’s group from Quincy and Laura’s group from the Courageous Sailing Center had all boated to the island showing off their beautiful new sea legs. Save the Harbor Save the Bay had officially taken over Spectacle Island. After lunch we took a nice hike up the hill to do some kite flying at the top and explore some small, off the beaten trail paths. The sun finally decided to cooperate and burst through the clouds just as we got back down for some swimming in the ocean. We found cool rocks and nice pieces of sea glass that of course were not taken since we learned on the boat ride that they are resources of the island and must not be removed. Time had flown by and it was then time to board the ship and head back to Piers Park. The boat ride back was a serene one knowing that for some of us, we had just taken our first step ever onto an island and for me onto one of the Harbor Islands. We enjoyed the breeze and warm weather as the boat pulled back into the Piers Park dock. I watched the kids walk to their cars explaining everything they had learned and done on the island to their parents. A successful trip had come to a close, but an excitement about new opportunities to revisit the islands and learn more about the Boston area restored. Well, today we all got a special treat at Piers Park! One of our camper's father, who is a scuba diving enthusiast, brought in a variety of marine life from a recent dive way off of George's Island. 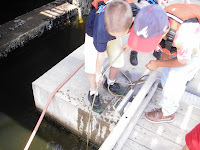 In a cooler filled with sea water, the kids were able to touch and learn about these sea critters. The wildlife which we saw in the touch tank were sea stars, mussels, scallops, periwinkle snails, a green crab, and an empty moon snail shell to boot. Some of our campers were able to show off their extensive knowledge about these animals. What many campers found most intriguing were the scallops. Scallops are bivalves, meaning a mollusk with a two part shell, that live on the sea floor. If you watched them long enough, you can see their fan-shaped shells part to reveal a muscled mouth that is lined with little black dots. The "dots" are what we would call eyes, although they do not see shapes but rather detect differences in light and darkness. We could also looked inside the shells of some of the scallops and saw a red blob. Our camper's father explained that this red blob is actually a collection of scallop eggs safely being stored inside of the shell. Despite many scallops being devored by their main predators such as rays, we were able to take a closer look at this fantastic species. Another fun thing we learned about the scallops..........they can let out a jet of water that is bound to soak campers. Hi, it's Tom Regan again! This afternoon may have been filled with overcast skies and some rain, but a little pain is worth trying to catch a striped bass. We went fishing out by the locks at Castle Island in Southie. Even though there was no sun, we had lots of fun. The best part was that the kids did not even mind that it was windy and a little chilly. Conor was able to brave the elements with his blue poncho. I did wish that the warm weather we had earlier in the day had stuck around, but we made the most of the inclement weather. I look forward to what tomorrow has in store for us! Today was so fun! I had a great time with the kids at Piers Park. Two little girls and I went out on a boat but we really had no idea exactly what we were doing, but we got back safely! There was no rain (FINALLY), and everyone was patient. There was no fighting, no arguing or everyone was doing what they had to do. I think Piers Park is my new favorite site!! Michael AKA "Mr. Narwhal" admiring his new friend, one of the world’s oldest creatures, the Atlantic horseshoe crab, Limilus polyphemus. These animals have remained relatively unchanged on earth for over 300 million years. Animals such as these are often referred to as living fossils, unlike Bruce - who is just old. By Popular Demand: BJ's "Sea Chantey Rap"
Coming to you from the office of Save the Harbor Save the Bay to fill you and everyone else in on what we did yesterday at the Southie Sailing center. Even though it was not all that beautiful outside and it was raining there were still kids at the sailing center that actually wanted to go fishing and to use the crab traps. So with those kids who wanted to go we went to use the crab traps and to fish on the dock. Even though it was raining the kids still had fun at the dock. After a while the kids started to get cold and wet because of the horrible weather so they wanted to go back to the sailing center. When we went back to the sailing center to keep all the kids from getting bored we played lots of fun games with them. So even though the day did not turn out how we had hoped it would and it was raining and cold the kids still ended up having lots of fun fishing and playing games. I am looking forward to many more fun filled days at Southie and I'll fill you in soon. Coming to you straight from the office of Save the Harbor Save the Bay to fill you in on what went down at Southey yesterday. Even though it was a not so beautiful day yesterday with the rain and all some of the kids still wanted to have some fun and go fishing and to take out the crab traps. So we went to the dock and went fishing and used the crab traps.The fun lasted for about an hour then the kids started getting cold and wet so we went back to the sailing center. So when we went back to the sailing center the kids just didn't want to sit there and do nothing so to keep them from getting bored we played some fun games with them. Even though it rained and the day did not turn out as beautiful as we wanted it to we still had fun with the kids going fishing and playing games. At the end of the day the kids still ended up having fun instead of doing nothing. Wooooooow!! I'm having so much fun at Save the Harbor/Save the Bay this is the best summer I've ever had, especially since I went to six flags on Saturday. 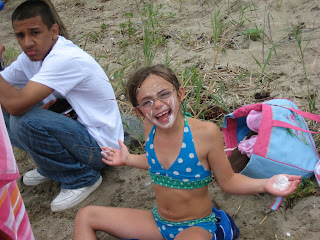 I'm having a blast, specifically at Camp Harbor View where the kids are so funny they make me laugh non-stop. But my favorite place of all is Quincy because the kids tell a lot of jokes and they are very interested in catching crabs and fishing. I hope I will be here next summer and I hope there will be less rain!! Yesterday was a very wet and rainy day at Camp Harbor View. The kids weren't enjoying fishing too much because of the rain and cold. Also, they were having no luck catching fish. The kids ended up heading in early. We joined up with the sailing group and played four square. In the process we figured out that Joe Square created the game. Also, we found out that jealousy is the worst emotion. But, that's enough for this blog. See Ya!